The Blizzak REVO 1 is Bridgestone's Studless Ice and Snow winter tire developed for the drivers of coupes, sedans and family vans that want more winter driving control and confidence than available from any all-season tire. Blizzak REVO 1 tires are designed to enhance wintertime traction on wet and icy roads, as well as in slush and snow. The Blizzak REVO 1 tread compound features "bite particles" to enhance traction on ice, slush and packed snow that are imbedded in Bridgestone's Tube Multicell Compound. The Tube Multicell Compound features small pores to reduce the risk of slipping on the thin surface film of water that makes winter driving so dangerous. The Blizzak REVO 1 in 65- and 60-series features a symmetric tread design while its lower profile and typically wider 55- and 45-seried sized tires feature a directional tread design. Both of these tread designs use circumferential and lateral flow-through grooves to help maintain good traction on wet and slush-covered roads while their 3-Dimensional zig-zag sipes and independent tread blocks provide the edges needed to help bite into snow. Combined, this allows the Blizzak REVO 1 winter radial to approach the traction provided by a studded tire on ice... without the use of studs. 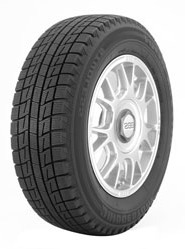 NOTE: The first 55% of the Blizzak REVO 1 tread depth features the Tube Multicell Compound while the remaining 45% features a standard winter tire compound. Bridgestone's Ultimate Network of Intelligent Tire Technology (UNI-T) brings advanced tire technologies together, taking tire performance to a new level. This combination of innovative tire design, roundness and tread compound maximizes the tire's performance, ride quality and wear.